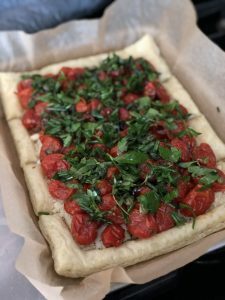 This tart is pretty easy to make and is both elegant and tasty. 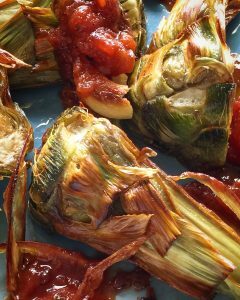 It’s great as an appetizer or paired with a hearty salad for a full meal. 1. 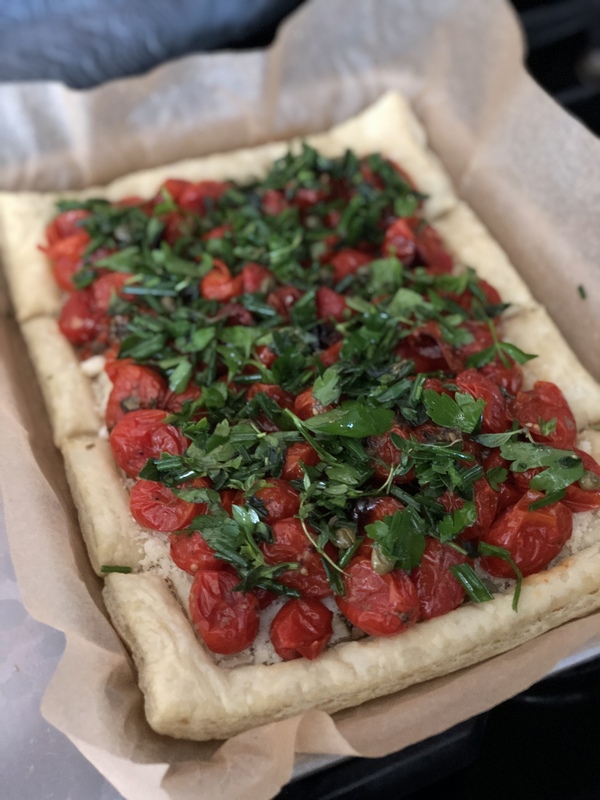 Fit pastry sheet into a parchment paper–lined, rimmed baking pan, pressing pastry against bottom and sides. Score the pastry all around by pricked interior with a fork. If it puffs up a bit stab with a fork to release bubbles. Bake until edges of tart are golden, 25 minutes. Sprinkle parmigiano over tart shell, and bake until cheese is melted and tart shell is golden all over, 15–20 minutes. Transfer to a rack; let cool. 2. Change oven to broil with the rack 4″ from the heat. 3. 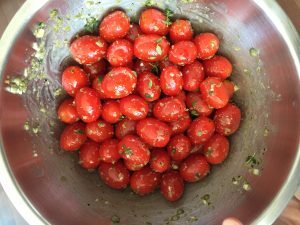 In a large bowl, mix together oil, minced garlic and capers (or anchovies); add tomatoes and season with salt and pepper. Toss to coat. Transfer to a baking sheet, brush all sides with egg wash and broil until tomatoes blister, about 12–14 minutes. Shaking pan once or twice while cooking. Let cool slightly. 4. 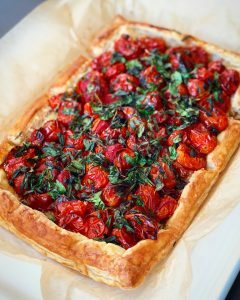 Use a slotted spoon to transfer the tomato mixture to the prepared tart shell; distribute tomatoes evenly. 5. Increase oven heat to 425°. 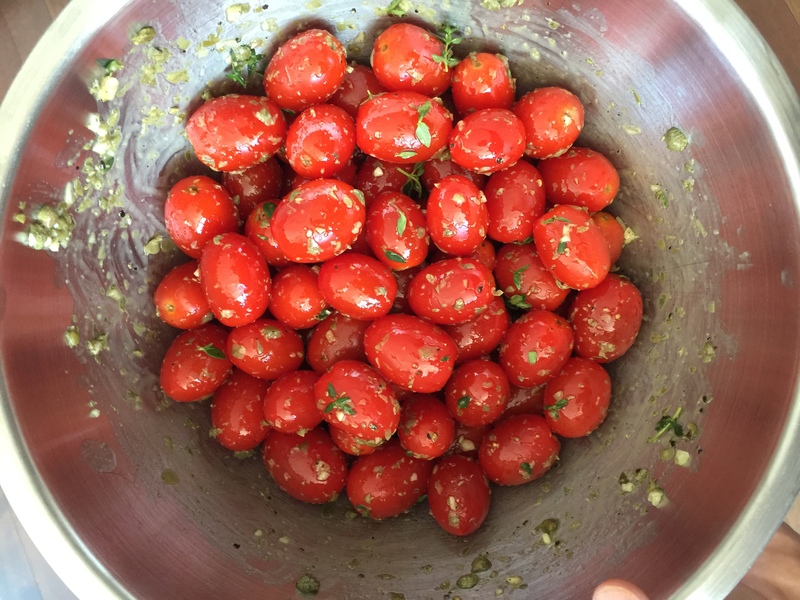 In a medium bowl, combine the parsley, chives, and oregano; sprinkle herb mixture evenly over the tomatoes. 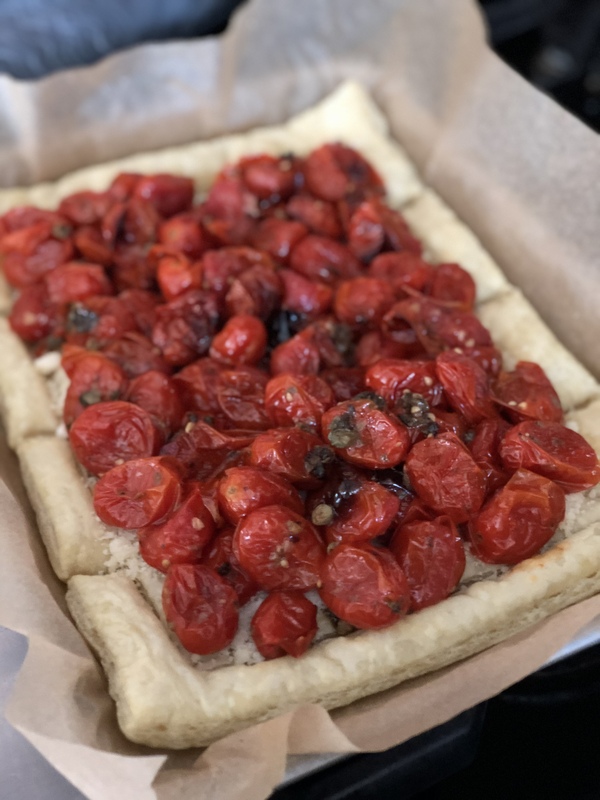 Return tart to oven and bake until hot, about 15 minutes. Let tart cool slightly before serving. These peppers are full of flavor and stand as a meal on their own. 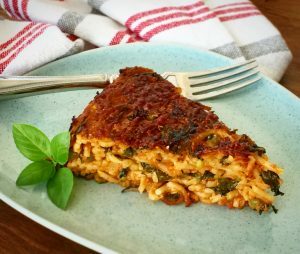 This is a dish that will appeal to both vegan and non-vegans. 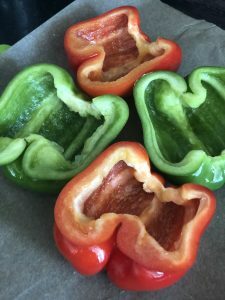 Don’t get scared away by the long ingredient list…these peppers are worth the effort and you will have enough to freeze for future meals as well. 2. Sauté onion in 4 tbsp olive oil for a couple of minutes and then add minced garlic. Sauté all until soft. 3. Add all spices: cumin, oregano, coriander, cayenne, chili powder, sweet paprika, smoked paprika, turmeric. Stir well. 4. 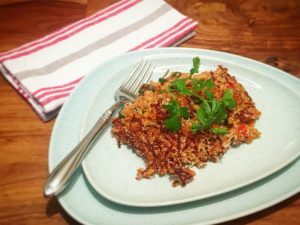 Drop in the rinsed lentils and quinoa. Add 1-2 cups water or low sodium vegetable broth. Simmer. Stir occasionally. 6. 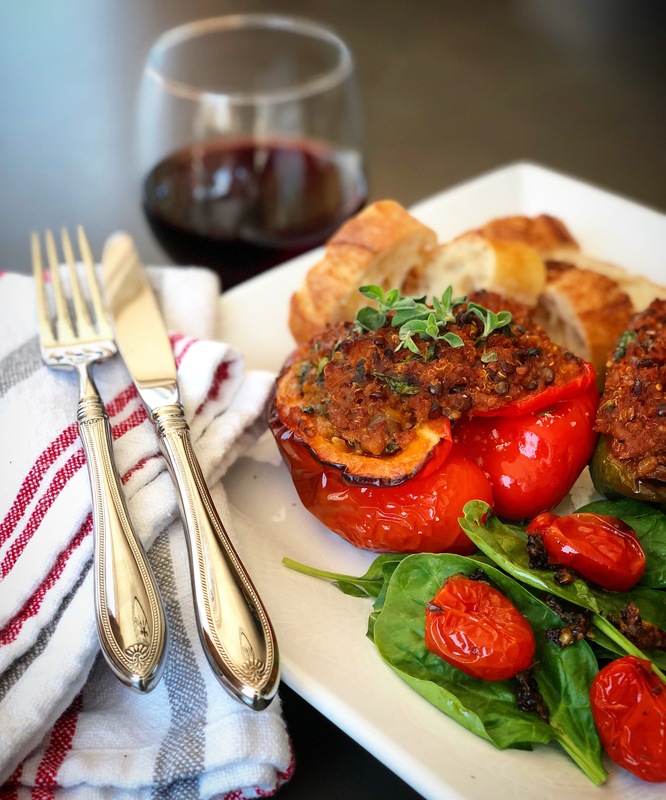 When the quinoa, lentils, and vegetables begin to soften, add in tomato sauce (start with 1 jar and add as needed) and tomato paste. 7. Stir and continue to simmer, taste for spices. Add salt & pepper. 8. 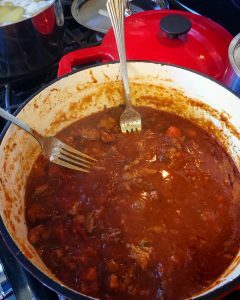 Cover and simmer low and add tomato sauce as absorbed. 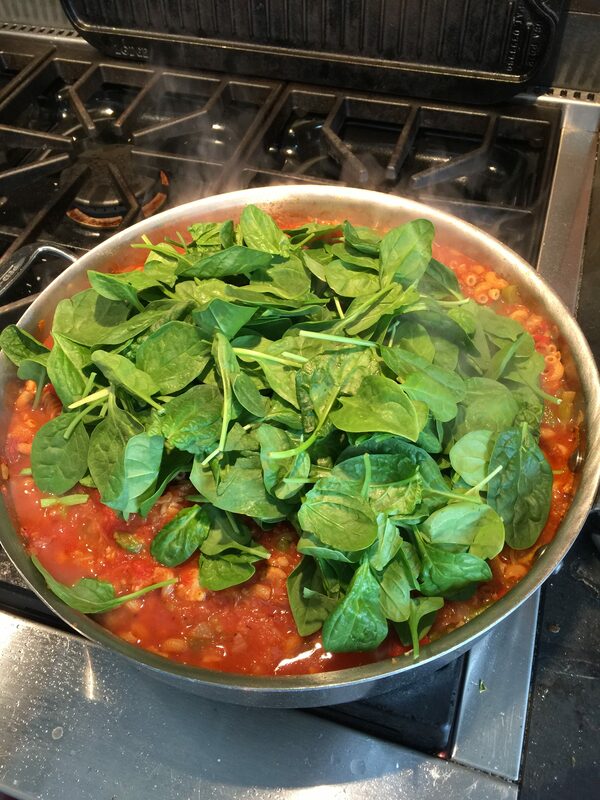 Once lentils are just past al dente, turn off heat, add parsley and chopped kale or spinach. Mix well. Cooked filling should be thick when it’s done. Taste along the way (you won’t be able to stop!). 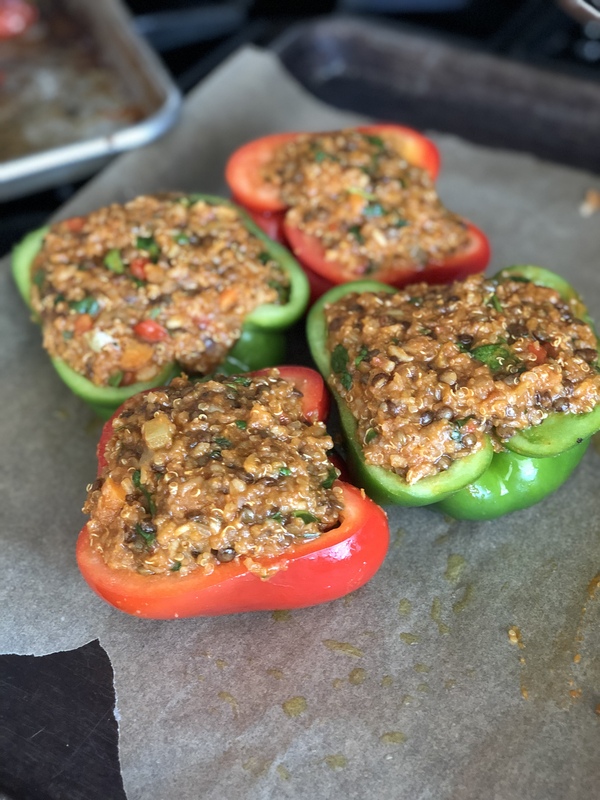 Lentils and vegetables will continue to cook in the oven so don’t worry if they are still a bit hard when you taste. 9. Rub oil on the inside and outside of dry, halved peppers. Place on parchment paper in baking tray. 11. Bake on high heat (450) for 10-15 minutes and then lower heat to 325 and continue to back another 40-45 mins or until peppers are nice and soft. Thank you, Elia, for featuring us in your recipe! 1. Toast the cumin and coriander in the dry pot, using a wooden spatula to continually stir spices over medium-high heat until they are fragrant, being careful not to burn spices. 2. In the same pot, add the olive oil, onions, and garlic. Sauté all until soft, about 6-8 minutes. 3. Add chicken stock, jar of Due Cellucci sauce, fresh oregano sprigs and bay leaves. 4. 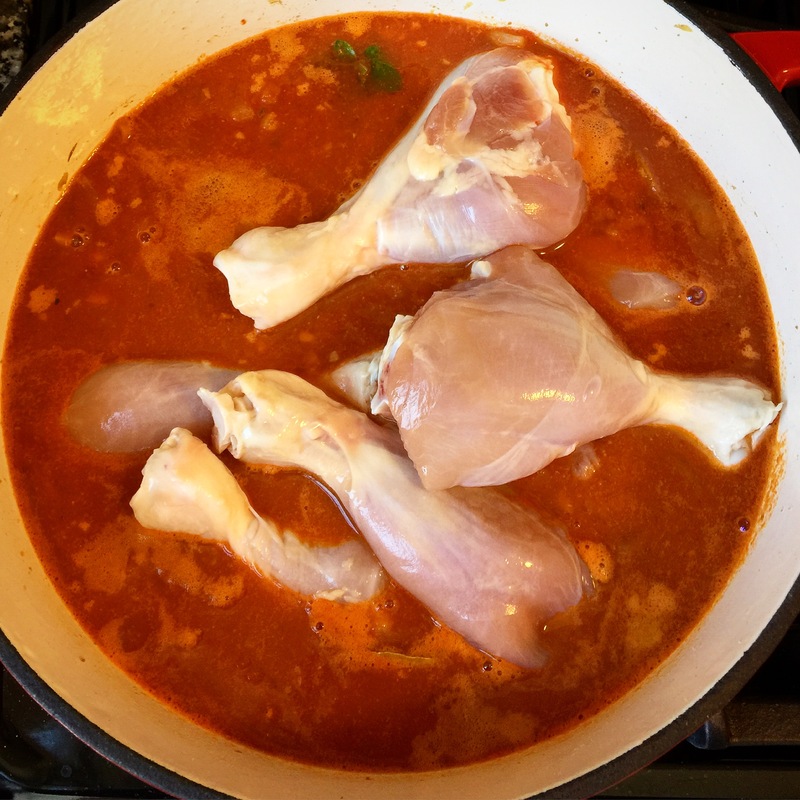 Add all chicken pieces, bring up to boil, stirring occasionally. 5. 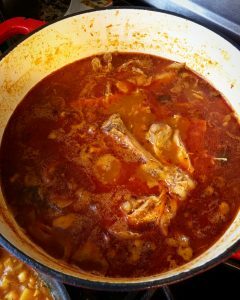 Reduce to simmer, cover partially and let cook for 45-55 minutes. 7. Continue to simmer, add salt, pepper and red pepper flakes to taste. Add additional cumin and coriander if desired. Remove bay leaves and oregano sprigs. 8. Stir in vinegar at end. Taste for spices and desired tang. While the sauce and meat are initially cooking, preheat oven to 400 degrees. 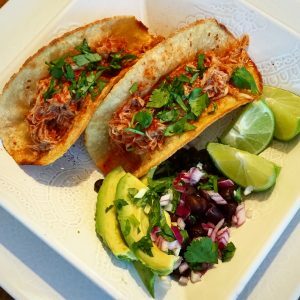 Take as many tortillas as you will be using, put them on a plate – using spray oil, spray each lightly and rub both sides with oil. Stack them. 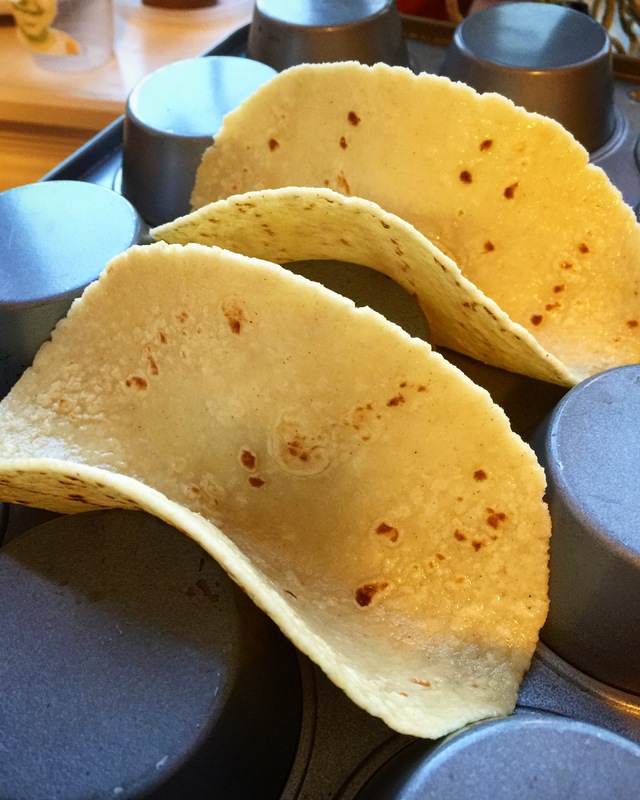 Using the back side of a muffin tin, fold and position the tortillas between the muffin cups (see photo) to get a rustic hard-shell shape. 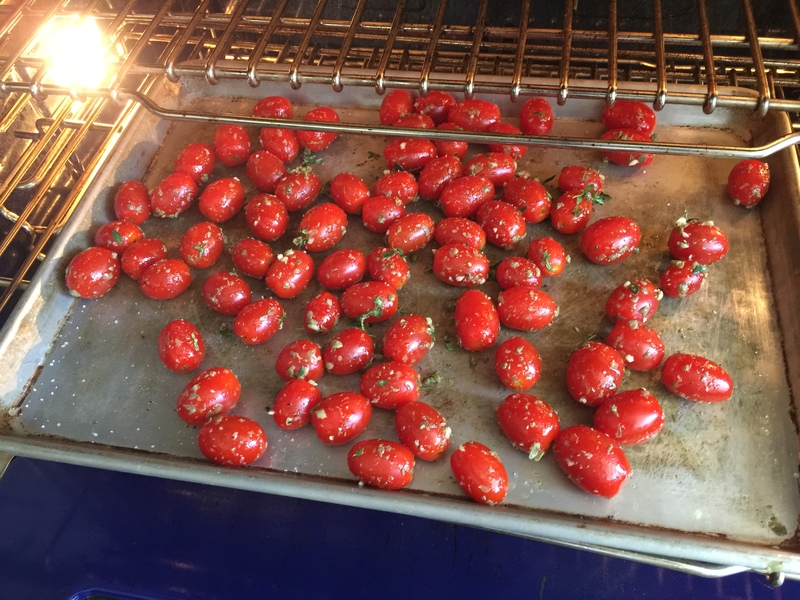 Place entire tin into 400 degree oven and bake until crisp, 10-15 minutes. Watch that they don’t burn. You may need to work in batches. Serve tacos freshly filled with Chicken Tinga and garnished with onions, cilantro, and lime. Serve with a side of black beans and rice if desired. 1 box of elbow macaroni pasta. 1 lb. of pork sausage or sweet Italian chicken sausage. 1/2 brown onion, fine dice. 1 each red and green bell peppers, diced. 1 8 oz carton of heavy cream. 1 8 oz package of shredded mozzarella. 1 32 ounce carton of low sodium chicken stock. 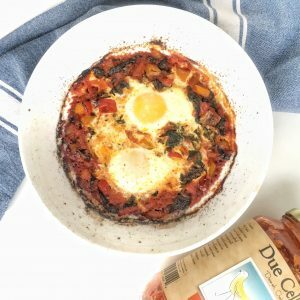 1 jar of Due Cellucci Traditional or Tomato Basil Sauce. 1 tsp each salt and pepper, plus more if needed for taste before transferring to oven. 2 cups raw baby spinach. 1/2 cup each of panko and grated Parmigiano cheese. 1. Rough chop all sausage. 2. 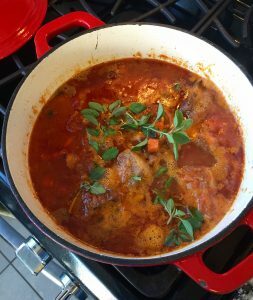 In a large skillet that is also transferable to oven, add 1-2 tbsp of olive oil over medium heat. 3. Brown chopped sausage. (Doesn’t have to be completely cooked through.) Set aside. 5. Add box of elbows, jar of Due Cellucci Sauce, half of the chicken stock and all of the browned sausage and juices, simmer medium low. 6. Make sure to stir occasionally to cover all pasta, and add in additional chicken stock as pasta begins to absorb the liquids. 7. Turn off heat (pasta should be al dente) and mix in heaping handfuls of raw baby spinach – keep adding, it really fades down. 8. 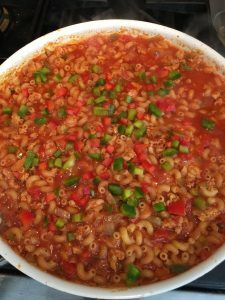 Mix in the cheese and cream, taste for seasonings, salt & pepper – feel free to adjust as needed. Wipe sides of skillet above sauce line and place in pre-heated 375 degree oven, on middle rack. Bake for about 10-12 minutes, you may start to see a little bubbling action. 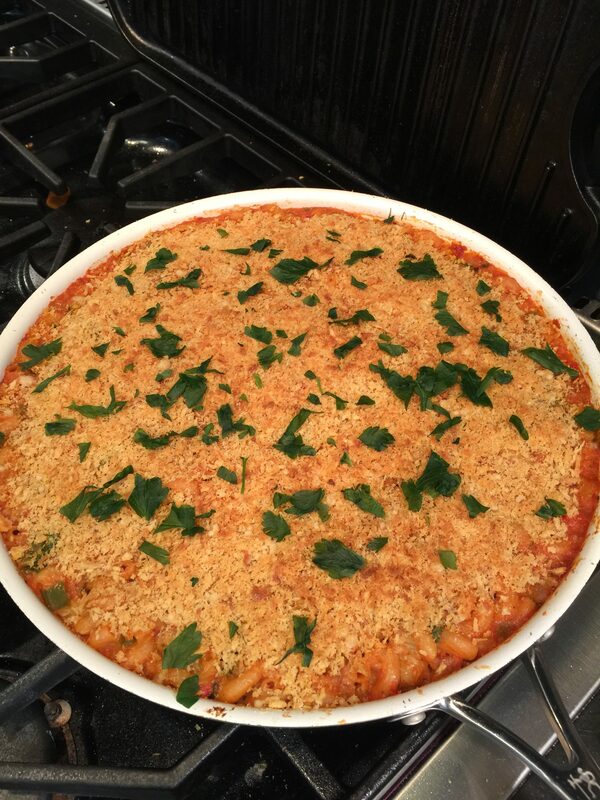 Take out of oven and cover the top with a mix of panko and grated Parmigiano. 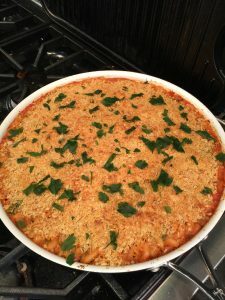 Return to oven and switch to broil to lightly brown the entire top of casserole. Middle or lower rack, about 3-6 minutes. Watch well, don’t burn! Remove from oven and let cool and sit for a bit, garnish with chopped basil and scoop out big heaps onto everyone’s plates! This is a baked version of my grandmother’s Spaghetti Pie, which is made from scratch, as opposed to using leftover spaghetti for a quicker version done on the stovetop. 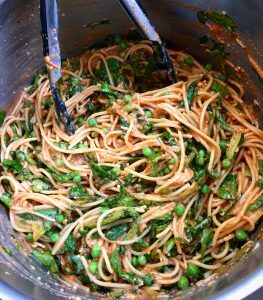 This recipe can have multiple variations by adding any any veggies or meat to the pasta mixture before baking it. Butter for greasing a springform pan. 1 lb. of dried spaghetti. 1 jar of your preferred Due Cellucci Sauce. 1 cup of grated Parmigiano cheese. 1/2 cup additional of grated Parmigiano cheese for topping the pie. – Heat oven to 425. – Generously butter sides and bottom of 9″ springform pan, using room temperature butter. – Very important: wrap the outside of pan tightly in aluminum foil, especially focusing on where the ring fits into the base – snugly crimp the foil well, all around the base area. 1. Bring a large pot of well-salted water to boil. 2. 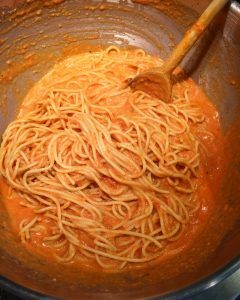 Add spaghetti to boiling water (break in half if desired) and cook to just al dente, about 2 minutes shy of being done. 3. 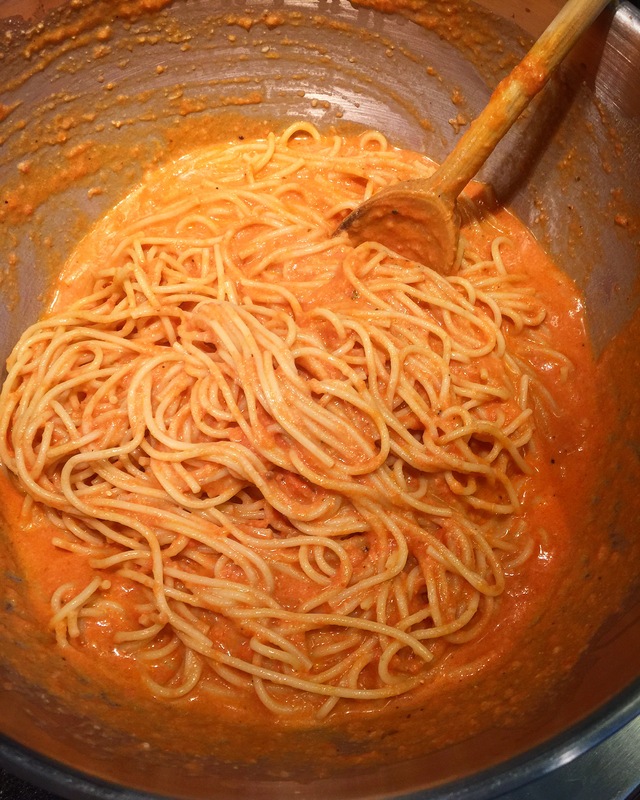 Drain well and let cool slightly, then toss the spaghetti with a jar of your favorite Due Cellucci Sauce. 4. 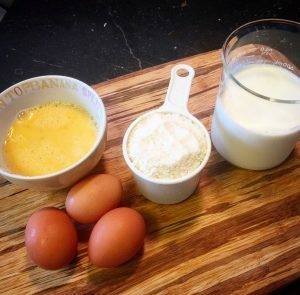 In a large bowl, whisk together eggs and milk, add salt & pepper, then stir in 1 cup of Parmigiano cheese. 5. Pour mixture over the sauced spaghetti and mix well. 6. Pour everything into the buttered, prepped springform pan, and place pan on a baking sheet. 7. Sprinkle remaining 1/2 cup of Parmigiano cheese over the top of the pie. Bake for 35-45 minutes. 8. Check for doneness by gently pressing the middle of the pie, to see if there is some bounce in the center. 9. Change oven over to broil setting and carefully let the top of pie get nicely browned. About 2-5 minutes depending on your broiler, use the middle or lower rack to not chance burning the top! Once out of the oven, carefully loosen all sides around the pie, using a soft butter knife or thin spatula/flat dowel so as not to scratch springform pan. 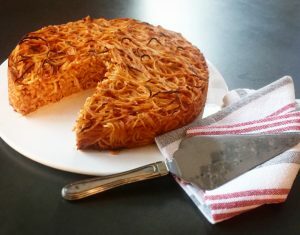 Then carefully remove the ring, run a spatula underneath the pie to loosen from the base and slide onto a serving plate. Often, you’ll find this dish served with a side of lemony garlic aioli, but we love it drizzled with warmed Due Cellucci sauce! 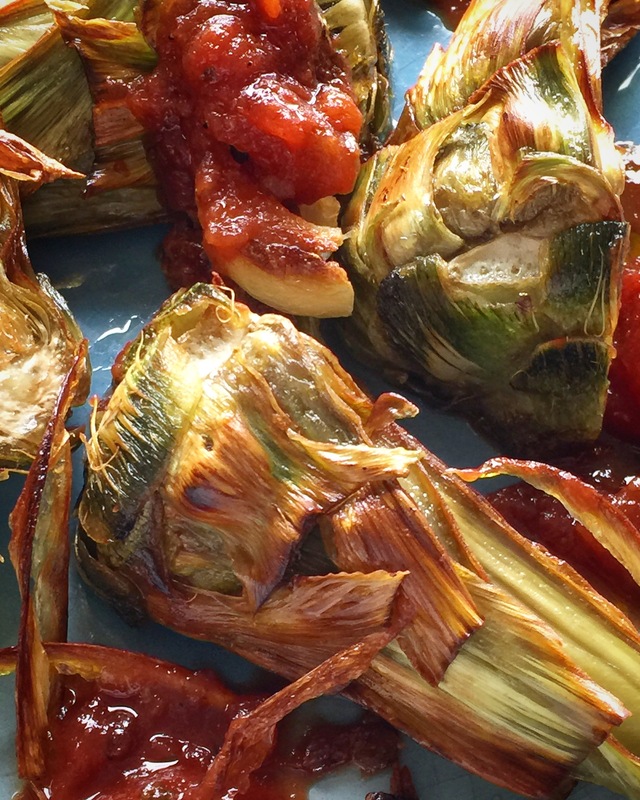 6 small (baby) artichokes, trimmed and cut in half lengthwise (see below). 6 cloves garlic, smashed or sliced. Half a jar of Due Cellucci Tomato Basil Sauce. 1. Trim all the outer tops of artichoke leaves and work inward, trimming off top half of all leaves, preserving the bottom meats. Cut artichokes in half lengthwise, and with a spoon, carefully scoop/scrape out only the bristly choke. Rinse and dry well and set them aside. 2. In a skillet, heat about 2 tbsp of olive oil over low/medium heat. 3. Add in garlic and sauté just to golden brown, being careful not to burn – garlic can brown very quickly. 4. Remove garlic and set aside. 5. Add rest of olive oil, add prepped artichoke halves (make sure they are dry!) and start to crisp them, turning until all sides are nicely browned and cooked. About 10-12 minutes. Remove artichokes. 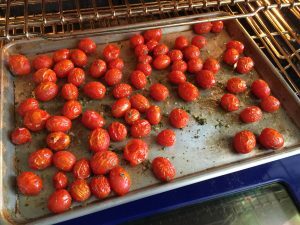 Note: you can also transfer them to a small baking sheet and into a hot oven, letting them finish cooking while you move on to heating the sauce. 6. 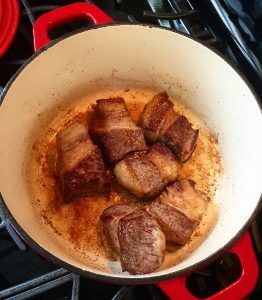 In the same skillet, with remaining oil still in pan, on very low heat, pour in sauce being careful not to splatter into hot oil. 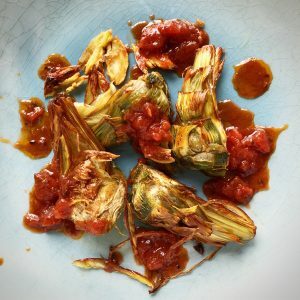 Warm and toss the sauce, plate your hot artichokes and drizzle sauce all over. Sprinkle with salt and serve. 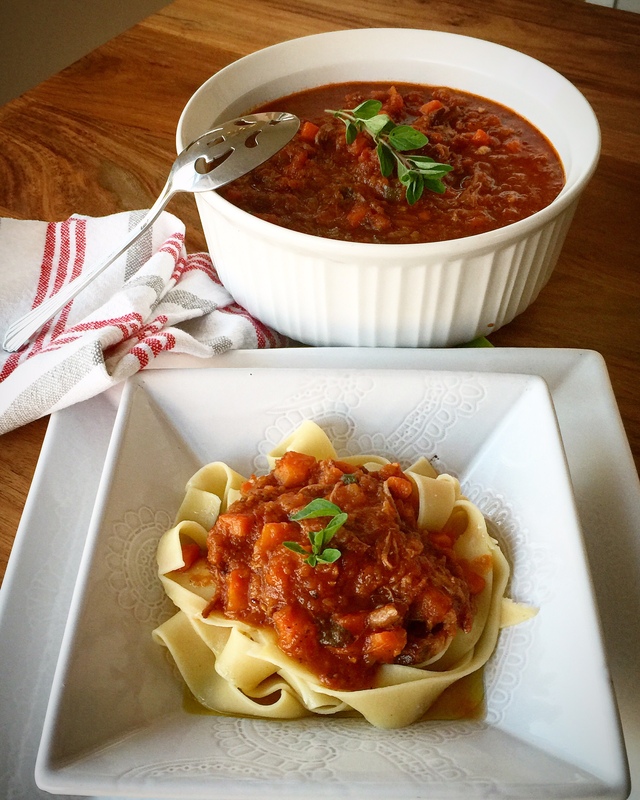 This meaty sauce cooks itself while you’re away at work! 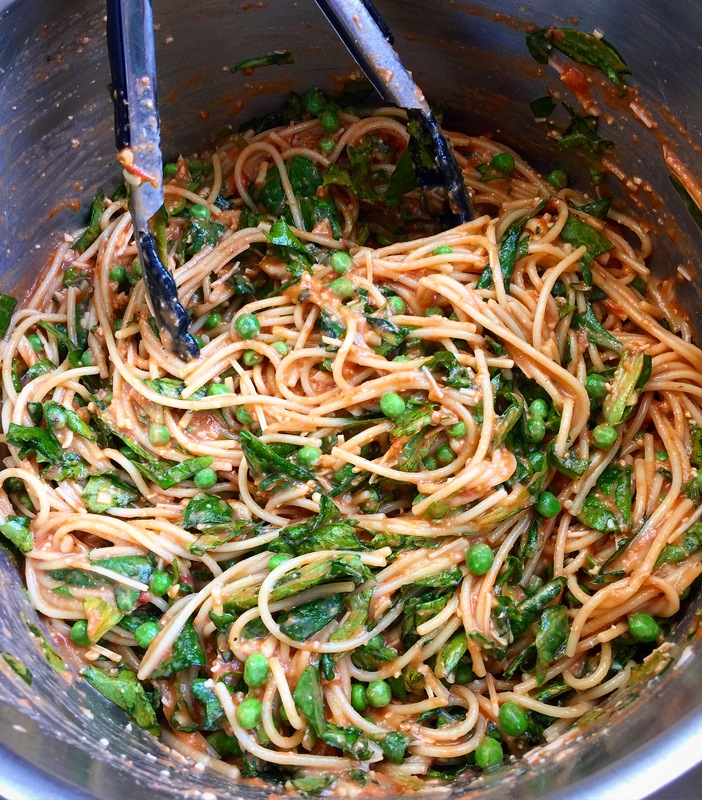 And gives you more than one option for an easy dinner (or two?! 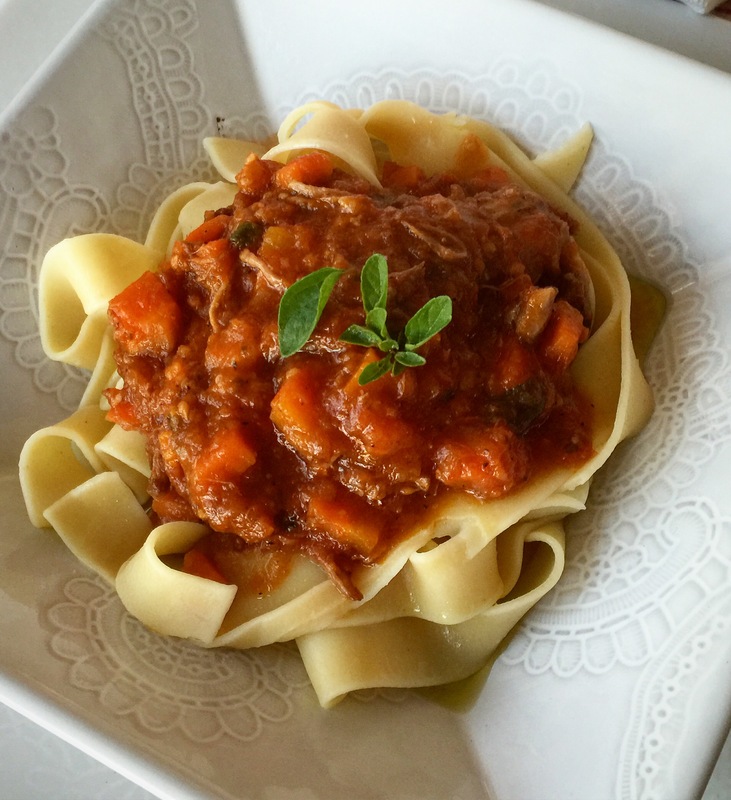 ), with wide noodles, like pappardelle, on toasted crusty bread or over simple polenta. 1. In a large skillet, heat oil over medium-high. Season short ribs with salt and pepper. In batches, brown the meat on all sides, about 10 minutes total. Does not have to be cooked through. 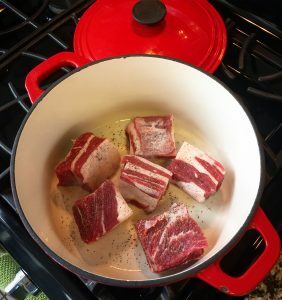 Transfer ribs to a 5- to 6-quart slow cooker. 2. Pour off oil, leaving about 1 tbsp in the skillet, add onion and carrots. Season with a little more salt and pepper and sauté, stirring until soft, about 3-5 minutes. 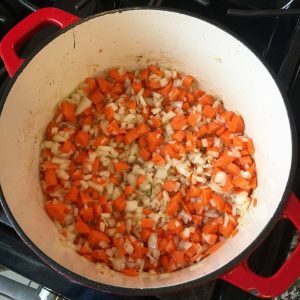 Transfer to slow cooker. 3. 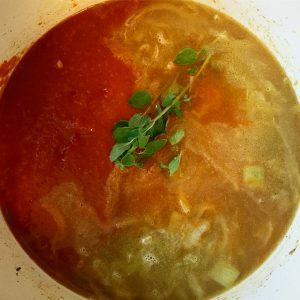 Add stock to pan, stirring and scraping up any browned bits from skillet with a wooden spoon, then pour all into slow cooker. 4. 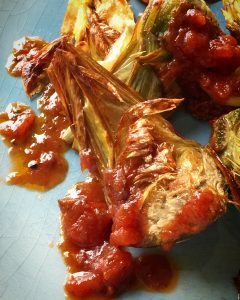 Pour jar of Due Cellucci Traditional Sauce into slow-cooker, add oregano sprigs, season with a little more salt and pepper. 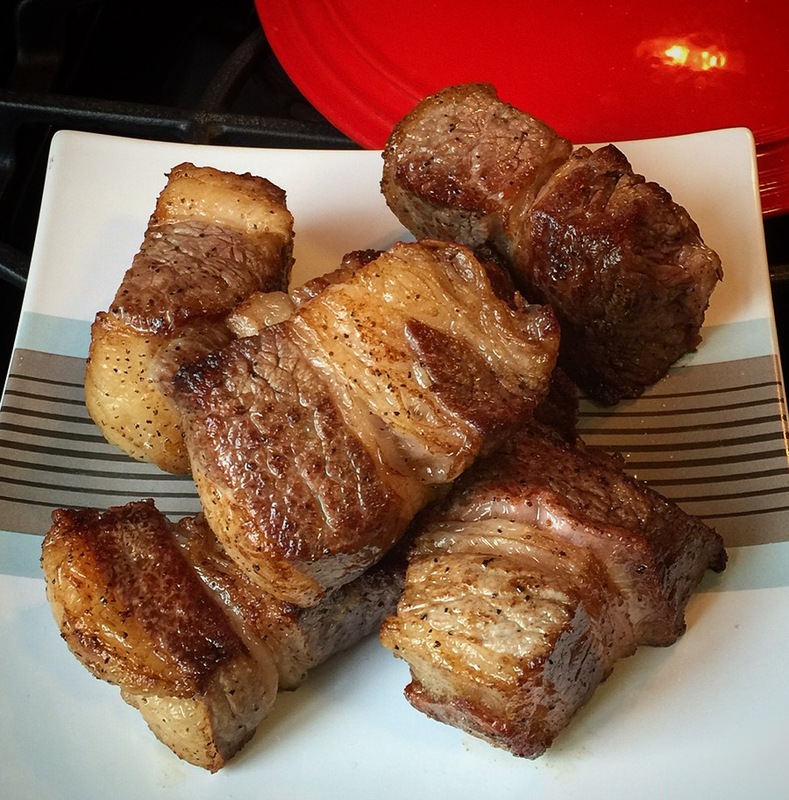 Cover and cook on high until meat is fork-tender, 6-8 hours. 5. With two forks, shred meat while still in slow cooker, working through all the pieces. Taste and adjust seasoning. Serve immediately, or let cool in liquid and reheat over medium before serving.